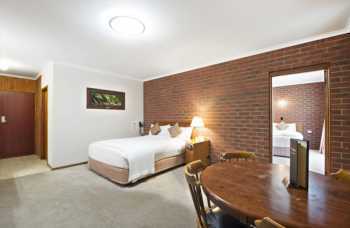 The Country Plaza Halls Gap offers you the best rates online (excluding packages, negotiated and company rates). 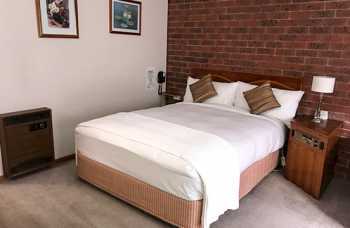 An older style room with a Queen bed and the option of an additional one or two king single beds (additional charges apply for extra bedding). These rooms are fully non smoking, on the ground floor and are located at the top end of the property along our driveway and Grampians Road. They all have electronic door locks, a wardrobe, spare pillows, a desk, a couple of chairs and have a private bathroom with shower facilities and a toilet. They also have tea and coffee making facilities, reverse-cycle air-conditioning, electric blankets, flat screen television, DVD player, in-room safe, iron and ironing board and a mini bar. Our most popular room for the budget conscious. 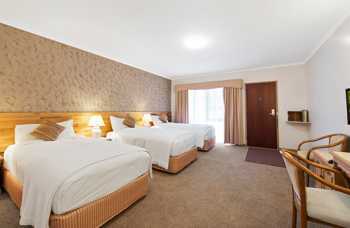 A spacious room with a King bed and the option of an additional king single bed (additional charges apply for extra bedding). These rooms are fully non smoking, on the ground floor and are located at the bottom end of the top courtyard and along our driveway. They all have electronic door locks, a wardrobe, spare pillows, a desk, a couple of chairs and have a private bathroom with shower facilities and a toilet. They also have tea and coffee making facilities, reverse-cycle air-conditioning, electric blankets, flat screen television, DVD player, in-room safe, iron and ironing board and a mini bar. If you are looking for a bit more space and quiet then this is the perfect option for you. A spacious and modern room with wood flooring and a King bed. This room is fully non smoking, is on the ground floor and is located at the bottom end of the courtyard with a pleasant outlook. It has an electronic door lock, a wardrobe, spare pillows, a desk, a couch and an office chair and has a private bathroom with shower facilities, large spa bath and a toilet. It also has tea and coffee making facilities, a coffee maker, reverse-cycle air-conditioning, electric blankets, flat screen television, DVD player, in-room safe, iron and ironing board and a mini bar. If you are looking for something special for a particular occasion or just want to feel special then this the room for you! The Country Plaza Halls Gap is located in the heart of the Grampians National Park (or Gariwerd as it is known to the traditional owners of the land). The Halls Gap village centre is only a short walk from the Country Plaza and so it makes an ideal base for sightseeing. 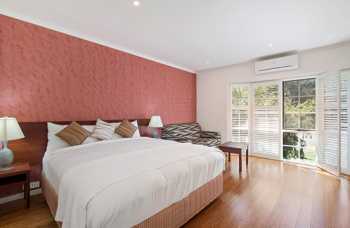 The Country Plaza Halls Gap is a comfortably appointed property with 51 rooms and is officially rated 3½ stars by Star Ratings Australia. It is a fully non smoking property with every room designated as a non smoking room and with the option of 4 designated smoking areas which are the only areas on the property where smoking is permitted. All 51 rooms have private bathrooms with shower and toilet facilities together with comfortable bedding, reverse-cycle air-conditioning, flat screen television, tea and coffee making facilities, mini bars and much more. 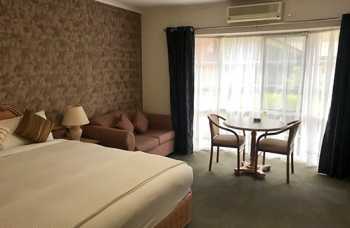 A choice of rooms is available from our older style Budget Rooms, our Standard Rooms, our more spacious Deluxe Rooms and our Executive Spa Room. Other facilities include off street parking, conference facilities, a fully licensed restaurant, a breakfast café, children’s playground and a guest laundry – just to name a few!